Vegan Hanukah Menu Planning – vegan in your city. I spend a lot of time thinking up ideas for special events at our house – and I tend to go a bit overboard. We are a family of three, and very rarely, are we accompanied by my in-laws. They have additional dietary restrictions to consider that can be a bit more challenging to accommodate – non-vegan keto – so when we eat together, it takes a little bit of planning to make sure everyone has something to eat. It’s also kind of fun working with additional restrictions because it changes things up, and usually makes us try something new. We’ve been doing a couple of things to try and encourage family to come over, so instead of dinners, we try to do breakfasts or brunches and invite people over when they’re less likely to have other things going on. I like the idea of help yourself buffet style brunch. Put a bunch of serving dishes out with food on them, some plates, and people find a place to sit and chat around the house. Bagels – I absolutely love making bagels at home, but you don’t have to, there are several commercially available vegan bagels out there – like these ones from Silver Hills Bakery. As for me, I have a regular goto recipe for my homemade New York style bagels from Sophisticated Gourmet. I know what the dough should feel like when it is ready. I can make it without even checking the recipe anymore. I’ve been dreaming about Pumpernickel Bagels lately, and I think I’ve found my goto for that with this recipe from (uh ironically[?] enough) Milk and Honey. Lox – Carrot or Tomato or both? Your choice! Or use Sophie’s Vegan Seafood Smoked Salmon (which is available irregularly through various speciality retailers). I’m really feeling this recipe from Delightful Vegans for the carrot smoked salmon the idea of blanching and roasting the carrots might seem a bit much, but it’s something that can be prepared a few days in advance. I used a recipe from the Field Roast cookbook for tomato lox, but this Carrot and Flowers recipe (which also includes a recipe for cashew cream cheese) appeared well before that book and it looks great too. Of course, you start with traditional latkes. 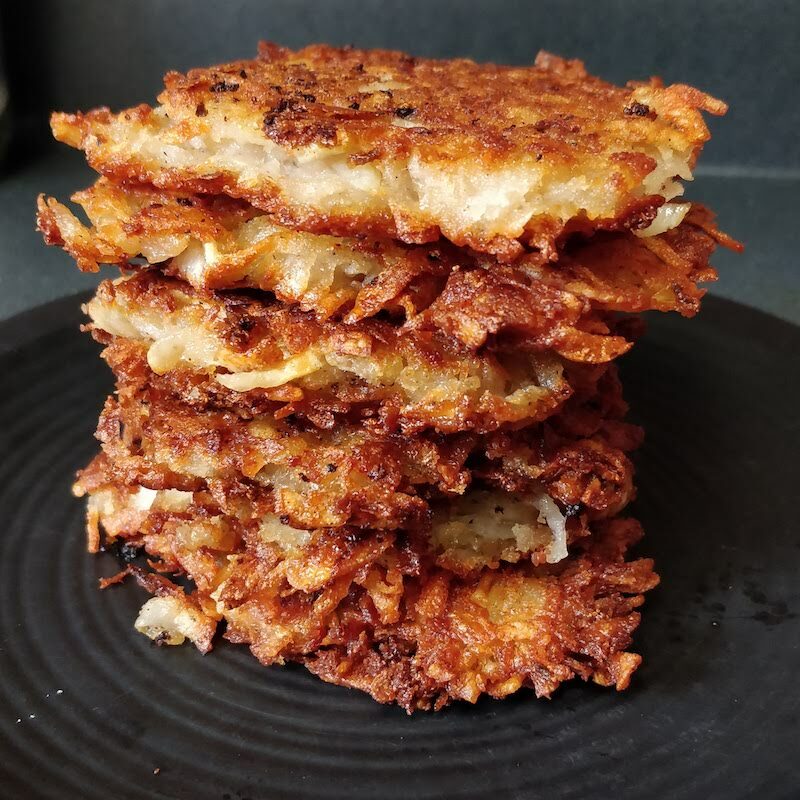 I am a larger shredded type of potato latke person, though I know a lot of people like using mashed or very finely grated potatoes in theirs. Your milage may vary. Brisket – the BlackBeet Roast from Avocado and Ales – this is something you can make a bit in advance and then bake on the day with some carrots and onions. I wouldn’t make it on the same day you’re prepping other things. Tori Avey’s Jewish Fried Artichokes are really calling to me this year, especially because we picked up a package of frozen artichokes during passover earlier this year and have yet to make use of them. Low Carb Vegan’s Seitan roast – I’m going to test this one out this year, with a bit of cauliflower, if only to have something fat and protein heavy kicking around in case anyone wants it! Hope you have a fun and happy holiday season if you celebrate anything this month. Do you have any holiday favourites?